This 5X5 bull was found in the south end of Sheep Valley, in a meadow on the trail to Willie's Flat, in Wayne County. It was killed on October 9, 1999, at about 6 p.m. 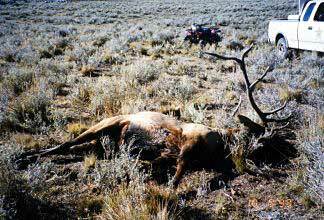 It was shot and left with a dead cow elk. Contact John Schijf at the Utah Division of Wildlife Resources, Southern Region Office at (435) 865-6115 with any information.  A cow elk was taken illegally on May 17 near Clancy, according to Montana Fish, Wildlife & Parks warden sergeant Mike Ottman. The animal appeared to have been killed at another location and then moved onto Forest Service land off Warm Springs Creek Road. All that remained at the crime scene was the boned-out carcass. This crime was discovered and reported to TIP-MONT by a citizen. Anyone with information on this or other wildlife crimes should call TIP-MONT at 1-800-847-6668.